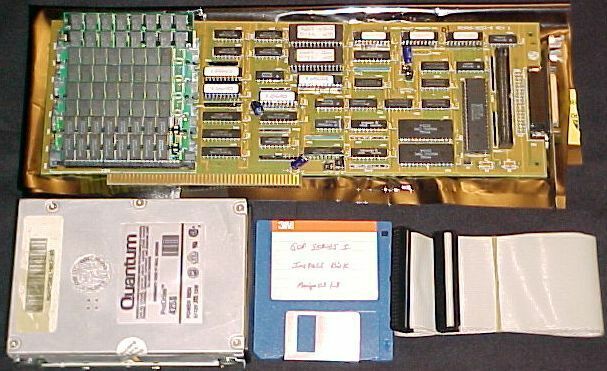 This board is the last of the original GVP Impact (Series I) disk controllers and RAM expansion technology for the Amiga 2000. It is based upon a 33C93/33C93A 8-bit SCSI controller that can transfer data to/from an onboard 16K SRAM buffer, which is then serviced by the CPU. The board has an internal 50-pin SCSI header and an external DB25 interface. SCSI bus termination resistor packs are soldered in. Memory capacity is up to 8MB in 2MB increments using pairs of 1Mx8 30-pin SIMMs. All memory in all configurations was compatible with other DMA disk controllers. GVP 1.0 (2), 2.0 (2), and FastROM 3.x (1) Autoboot ROM(s) are supported under Kickstart 1.3 and higher. There are jumpers for Autoboot ROM disable (remove), RAM settings, and for the HDD LED connector. All others jumpers are reserved. This product line was replaced by the GVP Series II DPRC-based DMA controllers. 0MB, 2MB, 4MB, 8MB - Autoconfig, populate in pairs from the bottom (edge connector) upward, set jumpers. 6MB* - leave the third pair of SIMMs out and populate the top pair of SIMM sockets, set jumpers, and insert an AddMem command in the startup-sequence for address range 800000-9FFFFF. * - this setting was intended for compatibility with the Commodore A2086/2286/2386 Bridgecards. The Bridgecards required that it be AutoConfig-located in Zorro II Fast RAM expansion space, aligned at address 200000 or 600000, and allocated a 2MB segment. 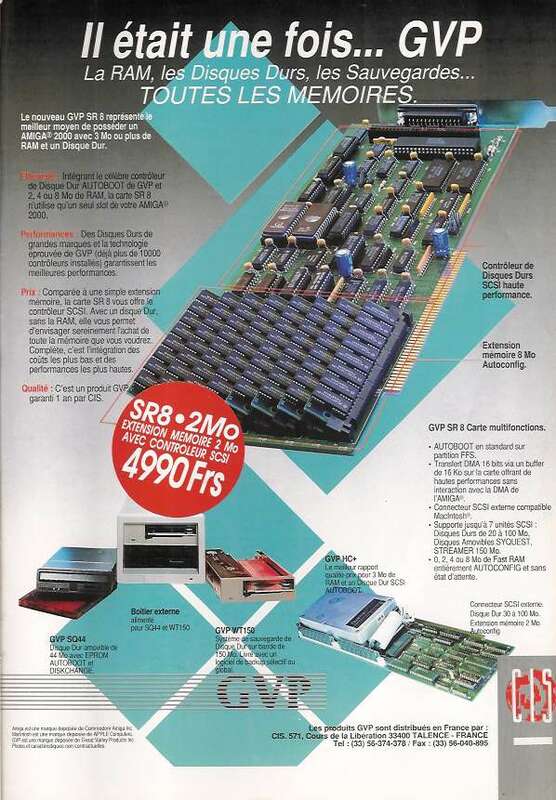 The AddMem command mapped the additional 2MB of RAM on the card, on the top pair of SIMM sockets. It was not possible to Autoconfig the additional 2MB of memory as another 2MB board as board slot order prevented the Bridgecard to be placed at one of it's preferred locations. Page contributors: NicDouille, Robert Miranda (GVP Tech Support).